Coco Chanel was a designer who loved dressing women in quality garments. She knew her fabrics and she knew her techniques. Generations later, the Chanel namesake passed her entire legacy and her design ethic down to Karl Lagerfeld, who eventually refreshed the Chanel brand with the iconic quilted bags we’ve all come to associate with the brand. Left: Singer Katy Perry attends Fashion Week with a quilted clutch. Right: Model Chrissy Teigen braves the airport crowd with the Chanel shopping bag. Lagerfeld is a perfectionist by nature, and it shows in the quality of the Chanel bags produced today. Even though many other brands have adopted the Chanel leather quilting technique, none have perfected it. Even triple-A knockoffs can’t quite keep up. 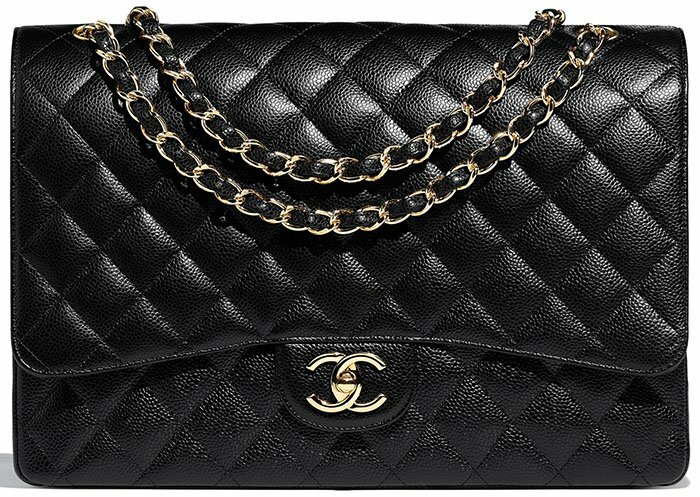 Unfortunately, it can be pretty easy for an unsuspecting buyer to fall prey to counterfeit Chanel vendors. Therefore, we put together a list of things to keep in mind when purchasing secondhand Chanel, to help you differentiate a real Chanel piece from a fake. If you’re a leather goods enthusiast, we’re sure you’re already able to tell a real leather from the synthetic version. There are a number of ways to tell the two apart but the most telling is the smell. Synthetic leather tends to smell like chemicals, while genuine leather has a musty and natural smell. Also take a look at both the give and color of the product. Natural leather is malleable and will soften over time, whereas synthetic leather retains its original shape for a long time. Color variety is more limited for natural leather, too, since the dyeing process isn’t as flexible as it is for man-made materials. Sloppy counterfeiters use a condensed typeface for the serial number — likely because their mold for leather markings is more limited. The serial numbers in counterfeit stickers bleed out and are poorly aligned, whereas authentic ones are very crisp and precise. Left: Singer Gwen Stefani goes full-on mom mode with a puffy nylon tote. Right: Myleene Klass sticks to the classic quilted handbag. Chanel does everything with precision, which includes creating the label’s “made in” text markings. Authentic Chanel products have proper spacing between letters. The text doesn’t bleed out, and all corners are clearly stamped. The text will have ample spacing at the bottom, while replicated products usually have text placed too close to the stitching. To the untrained eye, fake authenticity cards look pretty similar to authentic ones. For this reason, it’s important to know the kind of typeface Chanel uses on its products, as well as the spacing between letters. The dead giveaway here? It should look similar to the serial number. Another giveaway is the color of the print. Replicated prints will come out too yellow, or have a rainbow sheen while authentic ones look more muted and elegant. Chanel has a very specific way of setting its grommets during production. The brand uses a kick press machine with a specific die, so the metal is set back into the leather flawlessly. The grommet rolls back cleanly and symmetrically into the leather. There should be no ridges or edges when you run a finger across the grommet. Chanel has used Lampo zippers for the past two decades. Look for the Lampo logo at the back of the metal-tooth hardware. In case counterfeiters have already caught up, check the zipper engravings. They should be crisp and evenly spaced. Left: “Friends” actresses Jennifer Aniston and Courteney Cox stick to basic colors with their Chanel bags and clutches. Right: Lucy Hale goes back to basics with a black piece. 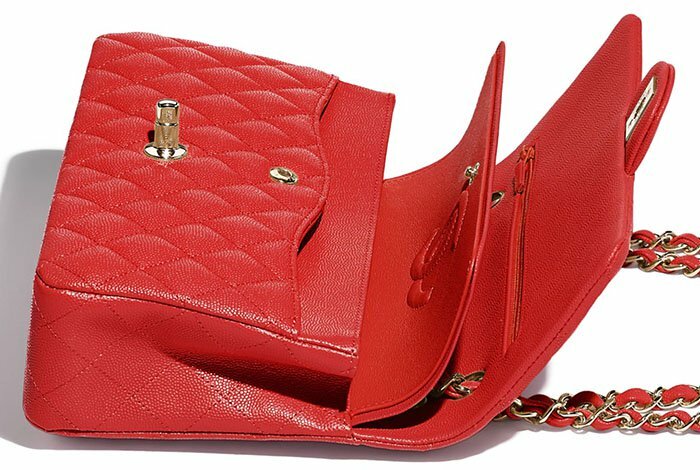 Counterfeiters often consider a Chanel piece’s dust bag as an afterthought. An easy way to tell if your purchase is a replica is to study the dust bag. 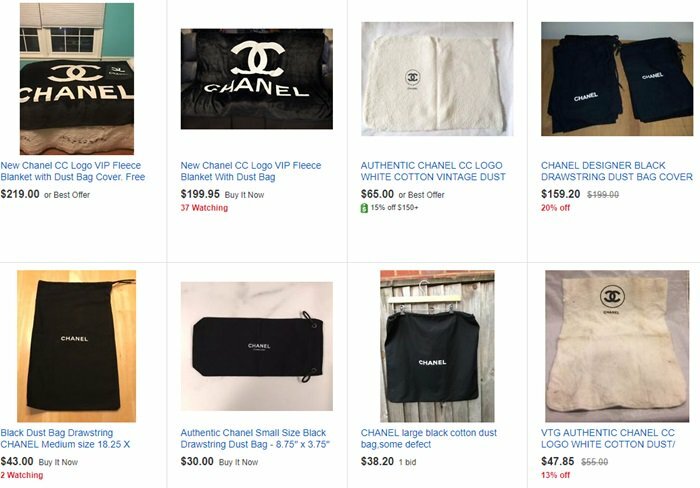 Chanel’s dust bags are extremely popular, and some retail on eBay for over $100. Chanel dust bags typically come in black or white. The expanded logo should be centered and printed in white, not gray. For bags that use the CC logo, the placement is usually at the bottom. For bags that have the CC lock, the right C must overlap at the top while the left C overlaps at the bottom. The edges of are usually rounded on counterfeit bags, and more defined on authentic ones. The CC lock should be centered on the bag — not too low or too high. The back of the CC lock hardware should have two screws holding a metal plate down. The plate must have “CHANEL” embossed on the left and “PARIS” embossed on the right. 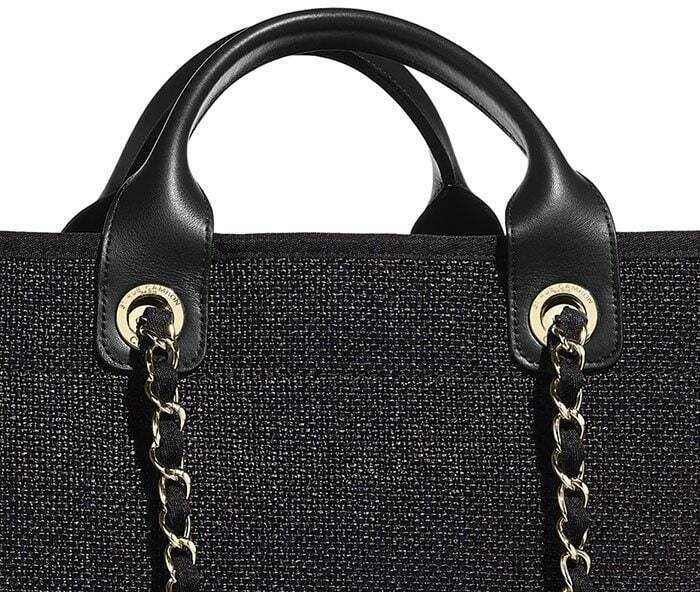 Only flathead or star screws (the latter only made its debut on Chanel bags in 2015) are used by the brand. Starting in the ’80s, Karl Lagerfeld began lace leather into the chains on some Chanel bags. Today, there are four ways the luxury brand does this. Four-fold with a stitch: This strap style is often seen on exotic-skin Medium Classics, Maxis, Jumbos and vintage camera bags. A strip of leather is folded until the two edges meet in the middle. Then it is folded one more time. Triple-fold: This is a technique used in most of Chanel’s Medium Classic Flap bags. A strip of leather is folded once and then folded back again. It has no visible stitching – only a rolled and a cut edge on one side and a rolled edged on the other. Cut edge: To create this type of strap, two piece of leather are cemented together then cut both edges, leaving the edges on both sides raw. Turn (or fold) to center: In this technique, two edges of a leather strip are folded together until they meet. The strip is then hammered until a line on side of the leather is visible and the two edges are folded. When purchasing luxury goods secondhand, it’s important to develop a sensitivity to details. While you can usually rely on smell alone to identify a knock-off Chanel bag, it’s still good to know what details to scope out when passing judgment on a bag with the Chanel logo. Buy only from reputable sellers. If a seller has an extremely high inventory of the same style, be wary. Finally, become familiar with any brand you’re considering purchasing from, and take notice of its collections. Chanel changes details every year, so it helps if you stay on track with current brand offerings. How much do Chanel bags and wallets cost? 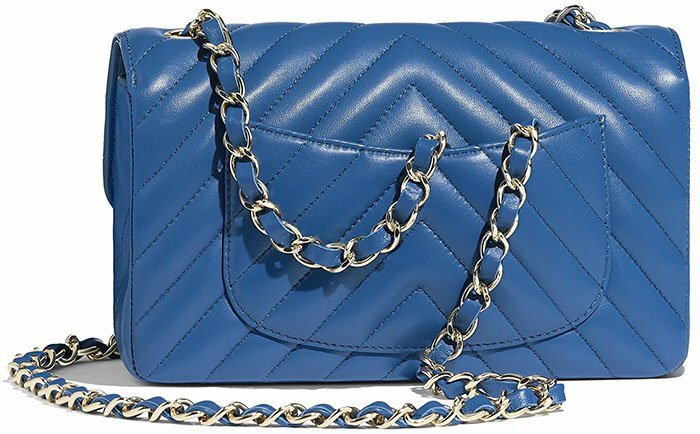 Chanel bags and wallets can range from $2,700 to $8,200. For a complete and updated price list, visit Chanel’s official website. If you need more assistance, this great video features more tips on differentiating between authentic and counterfeit Chanel products.